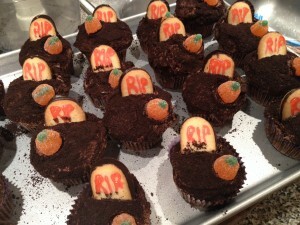 This post is a little late - I made them for a Halloween party. This isn’t so much a recipe, and I know you can find hundreds of ideas with astoundingly decorated cupcakes on Pintrest, but I was pleased at how cute these turned out and wanted to share them with you. I used crushed Oreo crumbs for the dirt, half a Milano for the headstone and a jelled pumpkin for a topper. The cupcake is a basic devil’s food cake with bittersweet chocolate frosting.